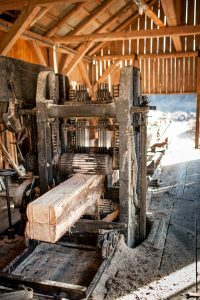 When it comes to operating a small portable sawmill, and/or drying your own wood with a solar kiln or small wood dryer, you know as well as anyone how moisture can impact the overall quality of your lumber. You need a reliable means of checking and controlling its moisture content (MC), otherwise, you jeopardize lumber grading or risk losing your lumber altogether. For instance, say you operate a solar kiln. Each percentage of moisture can be critical. Even if you maintain and control the relative humidity (RH) and temperature levels in the kiln, you still must continuously measure and monitor the changes in the wood’s MC to eliminate over-drying or under-drying the wood. When it comes to selecting a reliable moisture meter, many owners of small sawmill businesses and kiln drying operations like yours have depended on Wagner Meters for their moisture measurement tools. Throughout our company’s 50-plus years, we’ve listened to our customers’ needs and developed more accurate, innovative measurement devices. Today, we’re excited to announce the release of our newest product lineup: Orion. 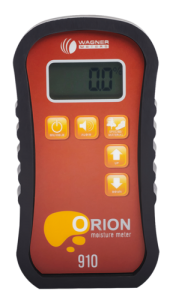 Orion moisture meters are the most accurate, technologically advanced, and versatile meters we’ve ever developed. Superior accuracy. If you’re using a portable sawmill, and you’re drying or storing your wood outside, you want to get accurate moisture readings. But condensation or rain on the wood’s surface can affect accuracy. Orion, however, with its patented IntelliSense™ technology is the only meter of its kind that minimizes the effect of surface moisture by measuring moisture IN the wood, not ON it. The temperature of the wood or environment can also affect meter accuracy, especially if you’re working outside in a non-controlled environment. But not with Orion meters which are Virtually Unaffected by Temperature. Furthermore, you can easily and quickly set the wood species you need to measure using the Fast Selection Species Setting capability. 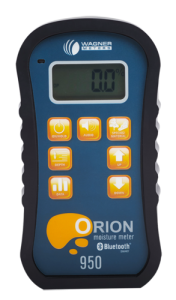 A quick reference species settings guide comes with the Orion moisture meter to help you quickly set the right value. Choose from a worldwide comprehensive list of hardwoods, softwoods, and exotic tropical species. On-site calibration. From time to time, a meter may need to be recalibrated to ensure it’s operating according to factory standards. After all, meters are electronic devices that can lose calibration when dropped or used in a rough environment like a sawmill. Of course, you can verify when other meters need to be recalibrated, but there’s a catch. You have to send it to the manufacturer – an inconvenience costing you time and money. Not with Orion. It’s the only moisture meter that allows you, the user, to recalibrate to factory standards for the life of the meter. And calibration is a breeze. Using our On-Demand Calibrator takes you all of one minute and you’re back in business. Data collection. If you need to keep track of statistics at your lumber mill, you can use our data collection function to continually improve your drying success rate. It allows you to record and store stats like high/low/average moisture content readings of your wood. And with our 950 model equipped to connect to our free Woodshop MC™ app via Bluetooth®, can send and save data on your computer or smartphone, set specifications for separate jobs, and more. Pinless. If you’re drying your lumber in a kiln with the goal of selling it as an end product, having a pinless meter like Orion is critical for huge time savings while maintaining a high-quality product. You can measure boards much more rapidly than with a pin meter. And you don’t have the hassle of punching holes in the wood and dealing with broken pins. Rubber boot and hard case. In a typical rough sawmill environment, protecting your moisture meter is paramount. 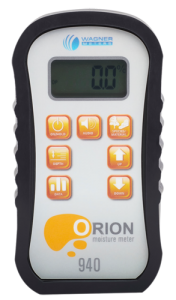 All Orion meters come with a rugged protective rubber boot and can be stored in a foam-lined hard case. 7-year warranty. As suggested earlier, sawmill environments can be hard on meters. Lots of things can happen. But not to worry. Your Orion meter is protected by our industry-best 7-year warranty. That – along with our exceptional customer service – makes owning an Orion worry free. Orion 910, ideal for single-person mills, Wood-Mizer operations, and kiln drying, features deep depth readings (up to 1.5-inches or 38.1mm) for wood you’re planning to use or sell as an end product. Orion 930 provides deep depth readings (up to 1.5-inches or 38.1mm) and shallow depth readings (up to ¼-inch or 6.35mm) for thin woods. 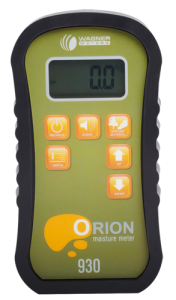 Orion 940, ideal for sawmills with multiple employees, offers deep/shallow depth readings plus data collection, enabling you to collect average, high, and low MC readings. Great for gauging quality and dryness of the wood you’re milling, drying, or preparing to sell. Orion 950, also great for sawmills with multiple employees, offers all of the above and lets you know when your wood has reached its equilibrium moisture content (EMC) with the environment. It’s also Bluetooth® app enabled for receiving/recording data and setting specifications for separate jobs. Can Wood Floor Cupping Be Fixed?